Following my transition from a summer to an autumn closet, one of the most frequent questions I receive every year is ‘how to style my waxed Barbour jacket‘. I bought my Barbour Beadnell jacket almost four years ago and haven’t looked back since! It is one of the most versatile pieces in my closet and I wear it non-stop throughout the seasons. With autumn being all over Scotland at the moment, the Barbour jacket made it’s appearance and of course, once again, the question I received through your messages on Instagram was ‘how to style my Barbour jacket this year?’. So I thought I could pull some ideas together and write a guide for you! Unfortunately, today I didn’t have time to go out for a photoshooting as it has been raining all day, however a quick look in the fashion archives of the blog and I realised that I have worn my Barbour Beadnell jacket so many times (and thankfully well-documented the majority of them here) that there was no need to take new pictures! ONE// From that time I visited the famous Glengoyne Scottish distillery and took a whisky and chocolate tour. So much fun! As it was a press trip that I went on a short notice I had to pack my luggage very quickly, but of course I made sure to pack my favourite Barbour waxed jacket with me. I wore it with a white dress layered with a grey knit, You can have a look HERE on how I styled it exactly! You can have a look on how I styled my Barbour waxed jacket on the original post HERE! THREE// These pictures were taken during a press trip in Poland with Ford UK and it was actually the first time I collaborated with Barbour! Their Press team very kindly sent me a few pieces to wear during the trip but unfortunately the box arrived on the day I flew out so I only saw the pieces once I arrived back in Scotland. 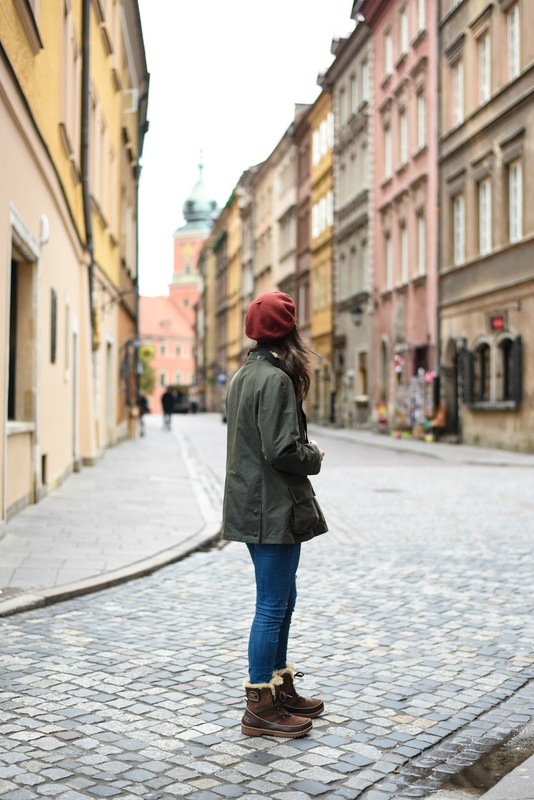 Still though, I packed with me the classic Beadnell that I wore that day we spent exploring Warsaw Old Town and took these beautiful pictures. I styled my Barbour waxed jacket with a pair of jeans, a thick knit jumper, my Sorel winter boots and a beret that my friend Wendy lent me-it was SO cold, just looking at these pictures I get the chills! FOUR// Look how young I was here! It was taken 5 years ago, just a month after I had moved in Aberdeen. That particular day I was exploring the streets of Aberdeen with a friend, just before Halloween and I remember asking him to take a few pictures of my outfit, proudly featuring my new waxed Barbour jacket! I was SO excited to wear my new jacket I even titled the Blog post as The Barbour jacket! As it was a rather warm, autumn day I styled my Barbour jacket with a white shirt, a pair of statement, tartan trousers, and a similar pattern, black and white scarf. Effortlessly cosy! FIVE// During this Winter walk in the woods I styled my Barbour jacket with a white, monochrome outfit comprising of a white pair of jeans and a white knit jumper. As it was extremely cold, to the point that my wee puppy, Cruzy was shaking, I also wore my Barbour grey, knit beanie and my Sorel winter boots. Going monochrome is the safest option with a beautiful jacket like this, and I much prefer it to the easy option of jeans and a top! Do you have a Barbour jacket? How do you style it? Previous Post Let’s Chat:: A week off social media! Love all of your outfits, especially the last one but I wish I could wear white without getting my top dirty within minutes! Great post through. I love Barbour jackets and I am always looking for new ideas to style my jackets! Great pictures and thanks for the ideas, a Barbour jacket is such a classic wardrobe item, especially at this time of year! Can you tell me please if you bought your usual size or if you would advise to go up a size. I can TOTALLY feel you Audrey! I have sadly only two Barbour coats in my closet but if I could afford it I would buy so many more!!! I want one of these jackets so bad! I love the way you style yours! I love the look of barbour jackets, the way you have styled it is so gorgeous! One of my good male friends has a barbour jacket and it always looks so good on him. I think it’s time I get one. I always think about buying a Barbour jacket but somehow I’ve never bought one. Hmm, think you’ve inspired me to get one this year! I so wish I would have bought the olive colored jacket! I went with navy, which is great-but I find that I usually style it with jeans, and it gets a little monochromatic. Love the ways you’ve styled yours! I can’t wait until our weather changes and I can pull mine out! Thank you Kristen, I was debating with my sister whether I should buy the olive or navy one but the former won! It’s a great, versatile colour and it’s perfect for the Scottish countryside 🙂 Definitely one of the most worth purchases I’ve ever done! This is such a great jacket, and so versatile! I’ve been wanting to get an anorak for fall, your jacket reminds me of it. Great idea to dip the hands in the old archives when the weather intrudes on a planned photoshoot. Thanks for sharing! They are for all year around but I love wearing this one around autumn, its so pretty! I don’t have a Barbour jacket, but I’d love one!! Anything with pockets and that is just the right thickness to keep me warm. Plus, they’re so stylish! You look gorg in yours! oooh I love this jacket and actually want to buy one this year – they’re gorgeous and snuggly making them perfect for the warm weather! Absolutely loving your photos again, they’re beautiful! Thank you so much Layla! Yes they are definitely one of the snuggest jackets I have in my closet! The styling is so lovely! I love the color of the jacket too! Such a versatile and functional jacket. I like your boots too in the first picture. Great post, I will certainly keep it in mind when I’ll decide to try a new jacket this autumn. Lovely photos and lovely place too. Such gorgeous photos, and I love this outfit! The combo if the jacket, boots, and beret is so cute! Aww thanks Annessa! I love my Barbour jacket, so versatile! I love your style Anastasia and wish you were posting your outfit posts more regularly. Thank you Marina! After receiving everyone’s comments on this post I am definitely consider bringing more regular outfit/fashion posts back! Thank you Patricia! 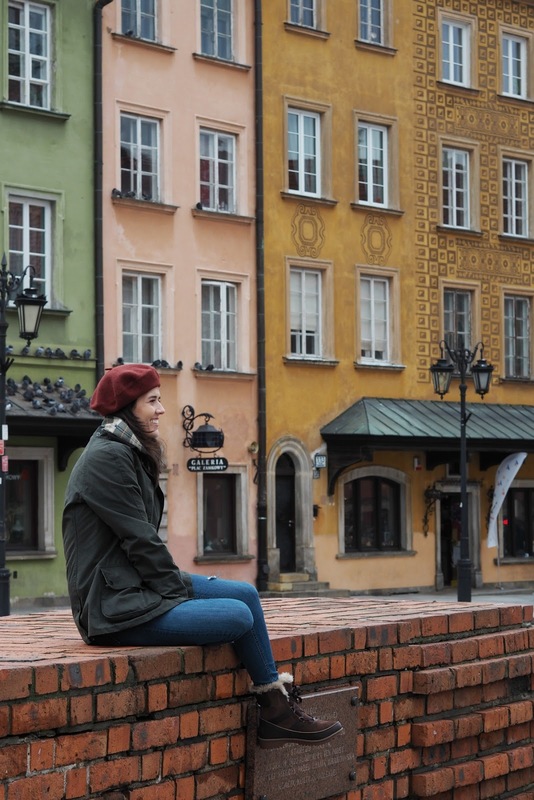 My trip to Poland was 2 years ago, hehe, so yes I very much enjoyed it and wish I can go back again soon. Wow your outfits are amazing! Great post dear. You look stunning. Wonderful jacket & you look pretty. Thanks for share baby!